Back in 1912, the idea of an artificial kidney was conceived at Johns Hopkins School of Medicine in the Department of Pharmacology, where I now work. Dr. John Jacob Abel, the first head of this department, with Leonard Rowntree and Benjamin Turner, tested and then published their experience with an artificial kidney in dogs. The principle is quite simple, but the practice is not: The blood is exposed, through a membrane permeable to water and small molecules but not permeable to proteins, to a solution similar in composition to body fluids, but minus the products of protein breakdown that accumulate in the blood when the kidneys fail. These products diffuse across the membrane, reducing their level in blood and body fluids. Abel, Rowntree, and Turner intended to use this technique to remove drugs toxic to the kidney from patients' blood. Sometimes artificial kidney treatment is used for this purpose even now. But most of the time it is used to treat kidney failure. In 1960 Dr. Belding Scribner and his associates in Seattle devised a method of access to the blood in the form of a shunt made of Teflon. Until then it had been necessary to use glass or metal connections, which soon clotted. Teflon made it possible for the first time to keep patients with end-stage renal disease alive. Scribner's team began treating outpatients repeatedly with dialysis for months and even years. The Teflon shunt has now been superseded by a direct connection between an artery and a vein, called an arteriovenous fistula, or by a graft, which connects an artery to a vein with a synthetic tube. The peritoneum (the membrane that encloses the intestines and the other abdominal organs) is highly permeable. Dr. Arthur Grollman, at the Southwestern Medical of the University of Texas in Dallas, demonstrated in the 1950s that dogs whose kidneys have been removed could be kept alive by repeatedly injecting salt solution into the abdominal cavity and later removing it. Substances like urea and creatinine diffused from the blood across the peritoneal membrane into the fluid. Chronic peritoneal dialysis became practical only after Dr. Henry Tenckhoff developed a peritoneal catheter that could be used long term. Now this technique is as widely used as the original hemodialysis technique, and patients may be treated by either method. These two techniques are very different, and discussing their relative merits is a complex task. 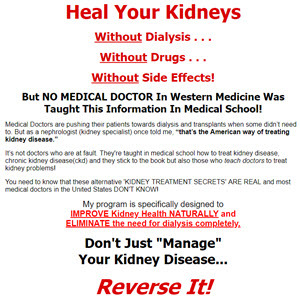 I recommend that those who are interested read Treatment Methods for Kidney Failure: Hemodialysis and Treatment Methods for Kidney Failure: Peritoneal Dialysis, both published by the National Institute of Diabetes and Digestive and Kidney Diseases. Chronic kidney failure is the one and only disease whose treatment is almost completely paid for by the U.S. government. This unique situation is the result of the passage, in 1972, of legislation that authorized the End-Stage Renal Disease program. This program provides reimbursement for all of the costs of dialysis and/or transplantation to patients certified to be at the end stage, after two and one-half years during which they (or their insurers) must pay. Peritoneal dialysis was not covered initially, but in 1978 the Food and Drug Administration (FDA) approved continuous peritoneal dialysis for the treatment of ESRD. Medicare began reimbursing the costs in 1979. The supporters of this legislation did not anticipate how the need for this treatment would grow. Today there are over 300,000 patients in the ESRD program in the United States, at an average annual cost per patient of $40,000, for a grand total of more than $12 billion per year. This figure excludes drug costs, which are substantial, especially for treatment of anemia.